The elegant simplicity of this 3D Cross Sculpture Piece makes for a striking profile against the sky. It is crafted entirely of copper and employs box style construction, which makes it very strong. 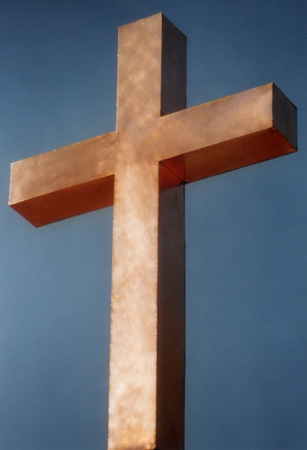 The cross depicted here is recognized as the Christian Cross, also known as the Latin cross or crux ordinaria. It is the most common symbol of Christianity, intended to represent the death of Jesus by crucifixion and his resurrection in the New Testament. Since each weathervane is made to order, depending on customer preference, we can create many different styles of crosses including, but not limited to the High Cross, Celtic Cross, Egyptian Cross (Ankh), Budded Cross, Orthodox Cross and even the Crucifix. In addition to copper we can also add optional accents in brass, nickel silver, gold and/or palladium leaf. West Coast Weather Vanes offers several weathervanes often associated with Christian faith. These include a Dove of Peace Flying, Dove of Peace Sitting (with Olive branch), Noah’s Ark, a variety of Angels and Roosters and even St. George and St. Michael Slaying the Dragon Weathervanes.